A family’s home should feel safe and secure, whether you’re resting peacefully in your bed or away on vacation. Investing in a security system is the best way to achieve this. But when you’re looking at your options, it always comes down to one thing: DIY versus professional home security systems. Which is right for you? It’s not uncommon for many homeowners to take their home security into their own hands. DIY security systems come in many shapes and sizes. The simplest of which are sensors for your windows or doors, and the most advanced ones have additional protection such as live operators and connectivity with your smart phone. What are the Pros of a DIY Security System? Because you install them yourself, there are no additional fees for installing a DIY system. Budget-conscious homeowners can look to DIY systems to add some degree of protection to their home without spending much. Like any professional work, installing a security system takes time. 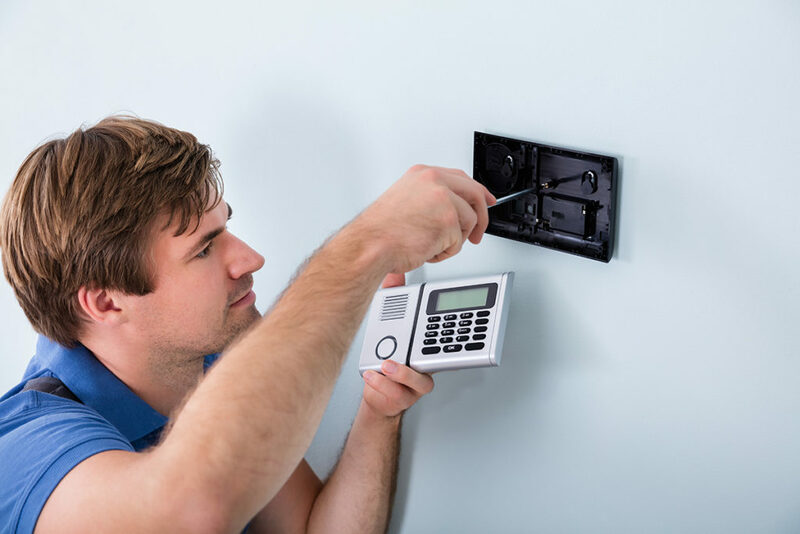 You must schedule a time for the technicians to enter your home and set the devices in place. A DIY system is installed on your own time. If you work odd hours or have a tight schedule, this can be helpful. What are the Cons of a DIY Security System? Security system installation can’t be done in just a few minutes. Even if you choose an incredibly simple system, they require planning and some light work with tools to put in place. You can’t simply place sensors or devices anywhere – they need to be installed in locations which make sense. If you purchase a more advanced system, it will come with technical set up instructions that may be difficult or frustrating to follow. You may believe professional security systems are all about the technology. That is not entirely true. Security professionals are trained and experienced in maximizing protection for your home and family. While you may think you understand the intricacies of your home and its vulnerabilities, you’re likely missing key components of building an effective security network. Additionally, the more advanced your security system, the harder it will be to use. You’ll be on your own for learning how to operate it. If you don’t know how to appropriately use your home security system, it can’t protect you. Home security devices you purchase yourself can run hundreds of dollars simply for the pieces – this doesn’t include additional fees for services like professional monitoring, if they offer them. You’re also on the hook for any maintenance with your equipment. If you have a faulty device, it’s your job to identify and replace it. Again – you are completely responsible for a DIY security system. If it fails to detect an intruder or emergency, you’ll be at fault in most cases. It’s likely the manufacturer will be able to identify an error with your installation – either in how you set up your devices, or in how you planned the layout of your protection. It’s possible to spend hundreds and waste hours setting up your own security system only for it to not function correctly. When you want to ensure your home is safe, a professionally-installed home security system is the preferred choice for most homeowners. Security companies like Habitec Security have the latest and greatest technology to defend your home from fires, intruders and other major risks. Security isn’t for amateurs. One gap in your home’s protection is all it takes for a thief to find their way to your most valuable possessions. When you work with a professional security company like Habitec Security, you have experienced technicians who understand safety. They can teach you how to use your new equipment and answer any questions you may have. DIY home security systems are “one-size-fits-all.” While they may have several packages to choose from, they aren’t designed for your specific home. Professional security installations are done after understanding your unique needs. These professionals will find the optimal way to protect your home and make recommendations on what you need to stay safe. If you’ve ever worked on any home improvement project, you know how even the smallest job can turn into a massive ordeal. When you hire a professional to install your security system, you can save yourself the hassle. You shouldn’t need to worry about your security. When we install your security system, you can trust it’s installed correctly. Additionally, you’ll take comfort knowing our recommendations are made to protect you from every foreseeable emergency based on our decades of experience. Professional monitoring and technical service means you don’t have to worry if your security system is functioning correctly. If there’s an issue, you’ll be notified immediately. In your busy life, it’s not always easy to pencil in a time for a technician to visit you. One of the unavoidable steps in protecting your home with professional help is finding time to do it. Fortunately, Habitec Security is flexible and can work with you to find a solution which fits your schedule. If you’re a new homeowner trying to secure your house, we can take this critically-important task off your plate. One of the biggest concerns for homeowners is the upfront installation costs and ongoing service investments with a professional security system. These costs can seem high compared to one-time costs of a DIY system. Remember with all things, you get what you pay for. Unmonitored security systems aren’t effective for protection – they’re only useful as deterrents and warning devices. If an intruder makes their way into your home, you won’t have help contacting 911 or other emergency services. In almost every case, a professionally installed security system is the right choice. You’ll have access to the latest technology for everything from fire alarm systems to state-of-the-art home video surveillance. While their costs can appear to be higher, the primary difference is you actually get the protection you’re paying for. Without professional monitoring, your security is often nothing more than a placebo which makes you feel safer. If you’re meticulous, knowledgeable about security and exceptionally budget-conscious, a DIY system may be okay to protect your home as a temporary solution. Just remember the most notable benefit to having a professional security service is knowing you’re never alone. Whether it’s a fire, break-in or medical emergency, you’ll have help just a phone call away. Contact Us Today to Learn More About a Professional Home Security System! Keep your home safe. If you need a security system for your house or business, our experts can design a system for your security needs and back by award-winning, 24-hour local monitoring in Ohio and Michigan. Contact us today!